The .22 caliber rimfire (in its short configuration) is the oldest surviving rimfire, metallic cartridge in the firearms world. The original .22 Short was developed as a black powder cartridge. Although it has been eclipsed in popularity by the .22 Long (now virtually extinct) and then the .22 Long Rifle cartridges, the .22 Short soldiers on, and still finds uses in applications where low noise is important and maximum velocity and power are not. But the .22 Short now costs more per round than it’s bigger and younger sibling, the .22LR. Arguably the most popular and most widely known and used cartridge in the world today, .22LR ammunition is also about the most economical way available to shoot “real bullets” from “real guns.” For 1911 aficionados, cost is assuredly a factor in how much and/or how often we can shoot. Budget range ammo in caliber .45 Automatic starts at about 38 cents per round, with premium .45 Auto ammunition going for a dollar a round. That was then, and this is now. Ammunition prices have increased substantially in the time since that article, all across the board. That 38 cents per round for basic .45 Auto is now up to 50 cents per round or more, depending on where (or if) you can find it. That’s bad enough, but the ammunition that has been hit with a double whammy is that old standby, .22 Long Rifle. Centerfire ammunition supplies are finally beginning to normalize after almost two years of shortages and hoarding, but .22LR remains elusive and in short supply. And the prices for .22LR are now approaching what we used to think of as normal for centerfire ammunition. At the local range this week, the shop didn’t have any of the brands I have been accustomed to seeing. They had a variety of ammunition, all from manufacturers I’ve never heard of. The prices ranged for $14 to $17 for a box of fifty rounds. That’s about 30 cents per round, which is what we’re accustomed to paying for .22 Magnum and for centerfire pistol ammunition. However, the prices for centerfire handgun ammunition have also escalated significantly. Shooting .22 caliber rimfire today is not the super bargain it was a few years ago, but it can still offer a price break compared to centerfire, and it offers other advantages as well: reduced recoil, reduced noise, and considerably less weight to tote to the range for an afternoon of plinking. So, although the cost saving is not as substantial as it once was, there are still reasons for and advantages to shooting a .22 rimfire pistol. 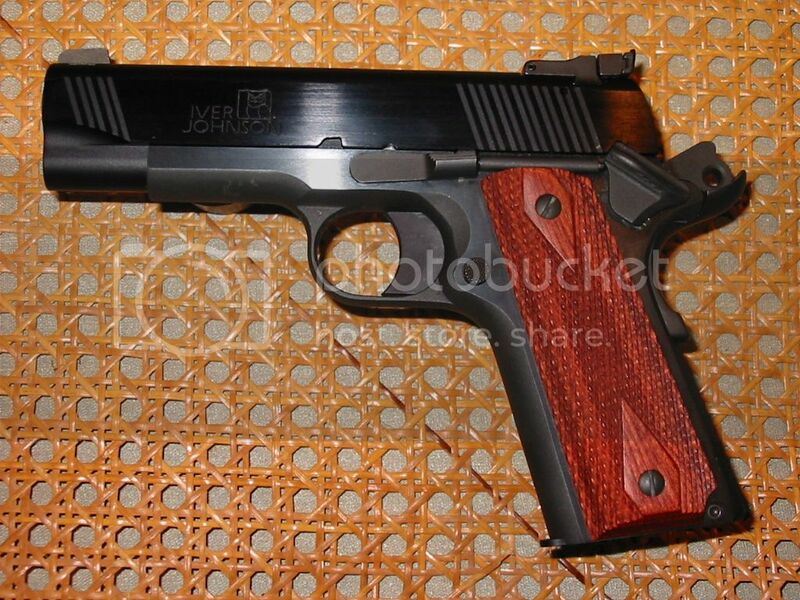 And there is now another choice available in the market of .22 LR conversions for the 1911: Iver Johnson. 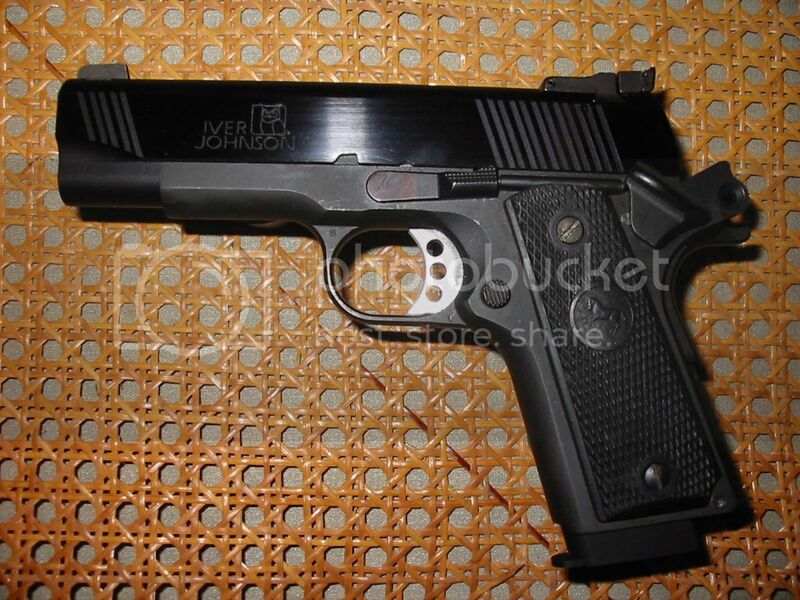 Iver Johnson is an old and respected name in the American firearms industry. The history of Iver Johnson has been covered extensively in reviews of two of their 1911 pistols, one by the late Steve Clark and one by yours truly. Readers interested to learning more about the company may find those reviews to be of interest. In researching background about the “new” Iver Johnson for my review, I stumbled across references to .22 caliber conversion kits. In fact, they offer four different models, each in black or silver. Two are Government Model length, and two are Commander length. The availability of a .22 LR conversion in a Commander length grabbed our interest (both John Caradimas, our fearless leader, and I are devotees of the Commander-size 1911), so in following up on the review of the Thrasher model we asked if Iver Johnson would be interested in allowing us to evaluate one of their conversions. They were interested, and not very long thereafter we received a care package from Iver Johnson containing one of their Deluxe model Commander conversions, in gloss black. Mechanically, the Standard models and the Deluxe models are the same, and they all use the same aluminum, 15-round magazines. Differences are that the Standard models have traditional, vertical cocking serrations, only at the rear of the slide; the Standard models have fixed, GI-style sights; and the Standard models are finished in a matte texture. The Deluxe models have slanted cocking serrations (front and rear); an adjustable, target-style rear sight; a flat along the top of the slide; and a gloss finish. The slide exhibited no stray machine marks or blemishes. Sights were solidly mounted and very visible. Take-down, however, was a bit daunting. 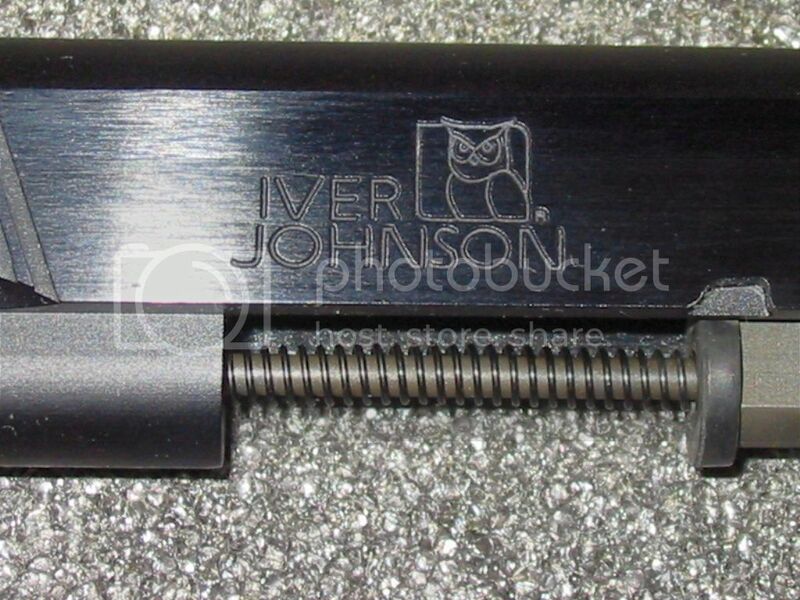 Rather than using a 1911-style barrel bushing, the Iver-Johnson conversion uses a small diameter, full-length guide rod that extends through the solid front face of the slide, below the muzzle. This arrangement is reminiscent of the Colt Mustang .380 and Pony .380, both of which have a similar setup. However, the two Colts used flexible, nylon guide rods. That was not the case with the Iver-Johnson convertible. In the end, we had to turn in our man card and read the instructions in order to disassemble the barrel from the slide. It is possible, but it isn’t intuitive and it’s a bit more difficult than field stripping a GI M1911A1. 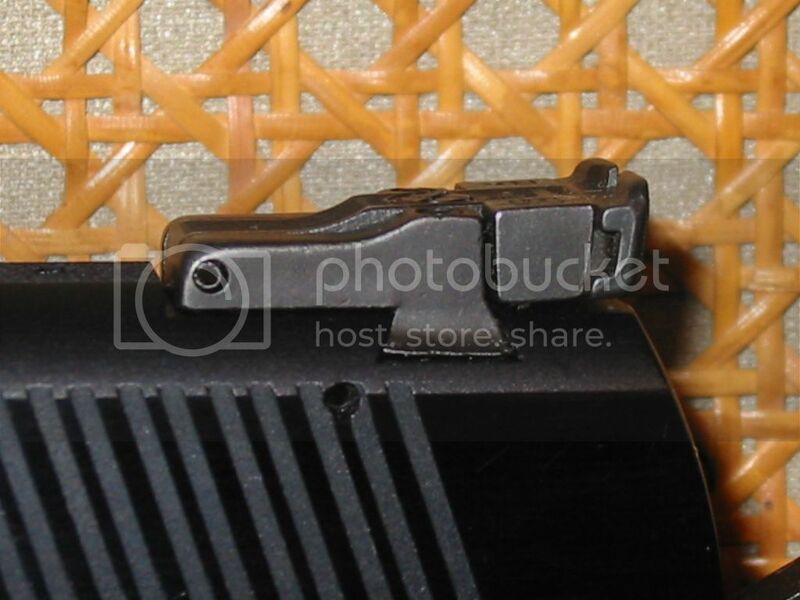 To remove the barrel from the slide, it is first necessary to move the barrel and the recoil spring guide all the way forward in the slide. Then, pinch the guide rod where it protrudes through the front of the slide and hold it there while moving the barrel all the way to the rear. Next, remove the rubber recoil buffer from the aft end of the guide rod assembly. 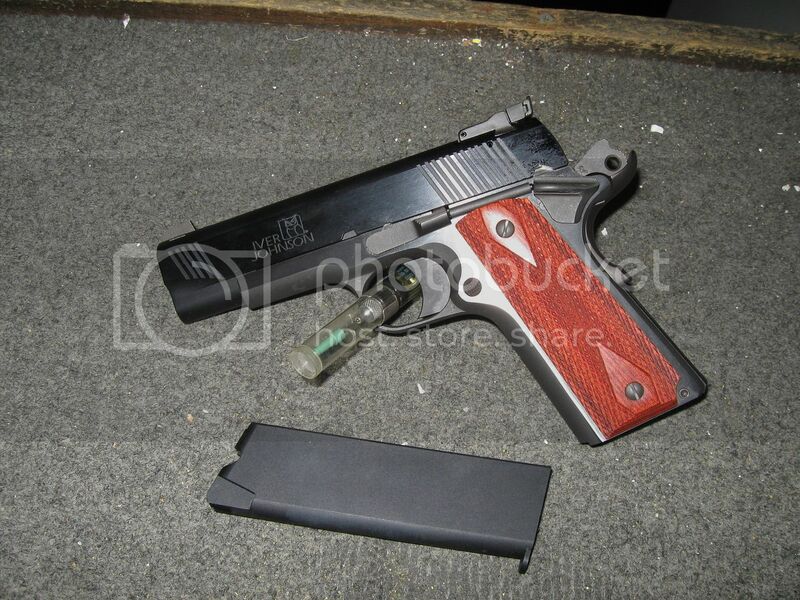 The rear of the barrel can now be lifted up and the barrel removed from the slide. Once you know how it's done, it probably takes longer to describe it than it takes to do it — but upon initial examination it appears that the barrel and recoil assembly were installed in the slide by black magic. 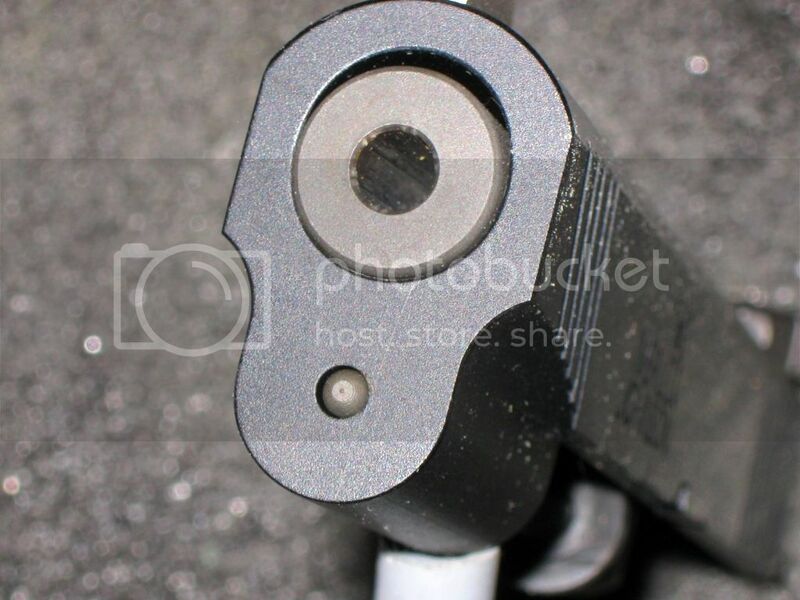 Muzzle end, showing solid front of slide and tip of the recoil spring guide. The Commander conversion, of course, is intended for … a Commander receiver. For that reason, we began our testing with the conversion mounted to a fairly recent Colt 1991 Commander receiver — with the Series 80 levers still in place. The majority of our testing (including all accuracy testing) was conducted on this receiver. However, knowing that gun owners are an inquisitive lot and that someone would undoubtedly ask if it works on other receivers, we also tried it on a Government receiver (an Argentinean Sistema Model 1927, which is a clone of a U.S. M1911A1); a Colt M1991A1 Compact (mechanically identical to the Officers ACP, with a 3½-inch barrel; and, finally, a Para-Ordnance Slim Hawg, with a 3-inch barrel and also equipped with a Series 80 firing pin safety. Except for the expected fact that the magazines extend below the bottom of the grip frame on the M1991A1 Compact and the Slim Hawg, the conversion went onto all of the receivers and functioned with all of them. We should point out that at least one of Iver Johnson’s competitors states in their owner’s manual that their conversion will not work on a receiver machined for a ramped barrel. For that reason, we were very interested to try the Iver Johnson conversion on the Para Slim Hawg receiver, since that pistol has a ramped barrel. We were pleased to find that it worked perfectly (which was what we had expected). The assembled slide and barrel weighed 12 ounces, compared with 17 ounces for a steel slide and barrel (with recoil spring and guide) from a centerfire 1911 pistol. That difference changes the balance of the pistol slightly, but not enough to make any major difference in shooting. With the light recoil from .22 Long Rifle ammunition (even the high velocity fodder that the conversion needs to function best), with the conversion mounted on a steel receiver there is essentially no felt recoil. The Para Slim Hawg used for this test was an alloy model, and with the aluminum alloy slide mounted to an alloy receiver the result was much like the complete Kimber Rimfire pistol – easy to shoot, accurate, and so light that it doesn’t feel at all like shooting a “real” gun. As commented above, the Deluxe version of the Iver Johnson Rimfire Conversion has adjustable, target-style sights. 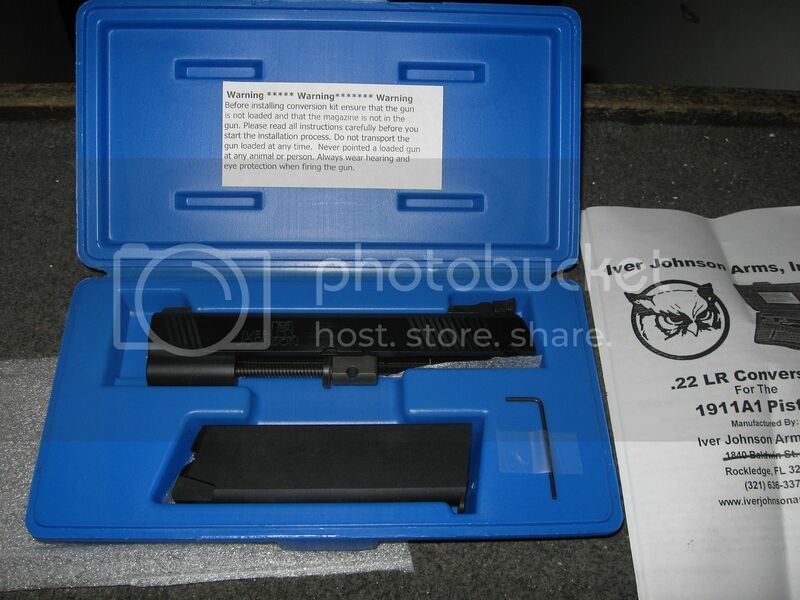 The rear sight is adjustable for both elevation and windage, and a small Allen wrench is included in the box for taking care of the adjustments. As most readers are probably aware, .22 rimfire ammunition isn’t easy to find these days. In the past, to test Rimfire pistols I have just gone to a local gunshop (or Mal-Mart) and bought one or two boxes of several brands and types of ammo, and gone shooting. This time around that was not going to happen, so I scrounged around my basement reloading area and came up with what I hoped would be a representative sampling of Rimfire leftovers from a mix of prior tests and .22 plinking days. In the past, I have adhered to our standard protocol of testing Commander- and full-size pistols (even rimfires) at our usual and customary 75 feet. This time, two things conspired to try something different. First, the targets I had happened to be official NRA 50-foot timed and rapid fire pistol targets. Secondly, some of the lights were burned (or shot!) out at the 75-foot distance in the lane I was assigned. Consequently, this test was shot at a distance of 50 feet. Two of the ammunition choices didn’t make it to the final accuracy testing. These were Winchester standard velocity and Federal American Eagle standard velocity. Not surprisingly, they couldn’t cycle the pistol. Since the recommended ammunition is high velocity, this can’t be regarded as a demerit for either the ammunition or the conversion. We simply didn’t continue with those two types for the accuracy testing. Aside from the conversions inherent accuracy and reliability with every type of high-velocity ammunition we had to throw at it, one thing stood out from this portion of our testing: the muzzle flash from the CCI Stinger was blinding! This stuff is obviously intended to be shot out of a rifle, not a handgun. None of the other ammo choices, standard or high velocity, came anywhere close to producing comparable muzzle flash. With accuracy testing taken care of, we moved on to some plinking. At a distance of 25 feet shooting off-hand (two-hand grip) we had no trouble keeping all rounds within the black when shooting fairly rapidly. With the conversion mounted on a steel receiver, the pistol weighed enough that recoil was very minimal, and the muzzle was easily controlled. The conversion ships with one magazine. 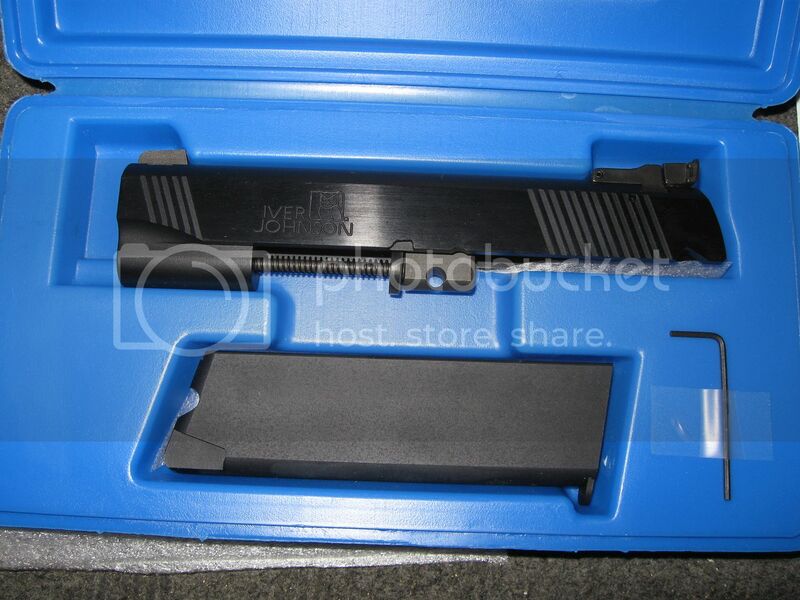 Spare magazines are available from Iver Johnson. Out of curiosity, we tried the Iver Johnson conversion with a magazine from a Kimber Rimfire. 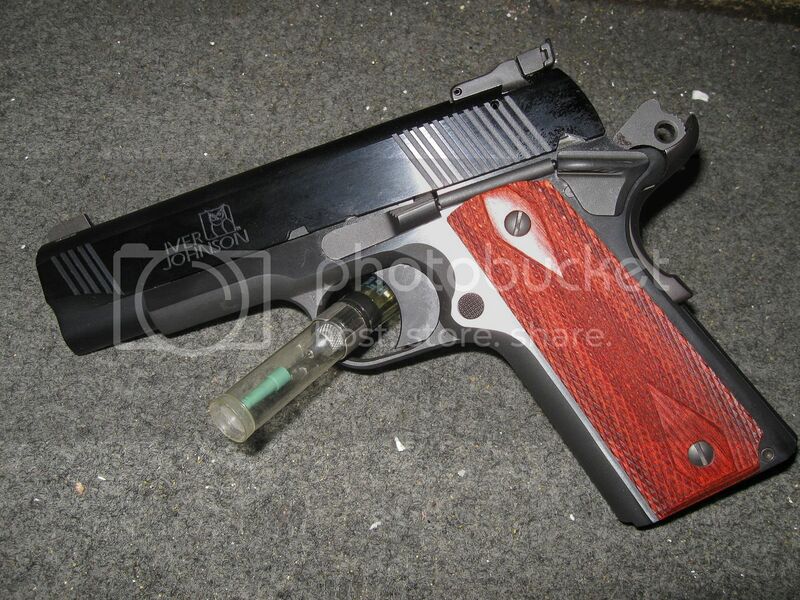 It functioned perfectly, so Kimber magazines are an option if for some reason Iver Johnson magazines aren’t available. Overall, we feel the Iver Johnson magazines are better. First, they hold fifteen rounds rather than the Kimber’s ten (Iver Johnson makes 10-round magazines available for states that limit magazine capacity). Second, the Iver Johnson magazine is solidly made of aluminum alloy. 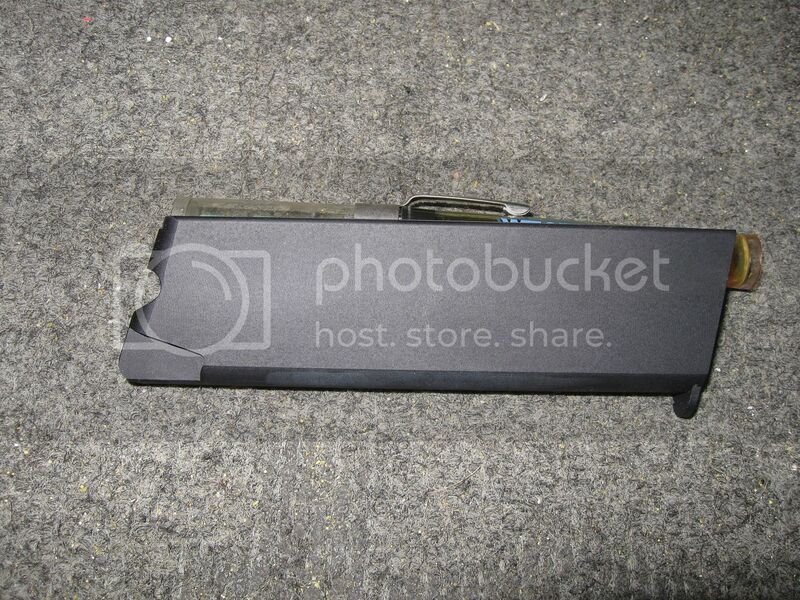 We don’t know the manufacturing process, but they appear almost to be extrusions. 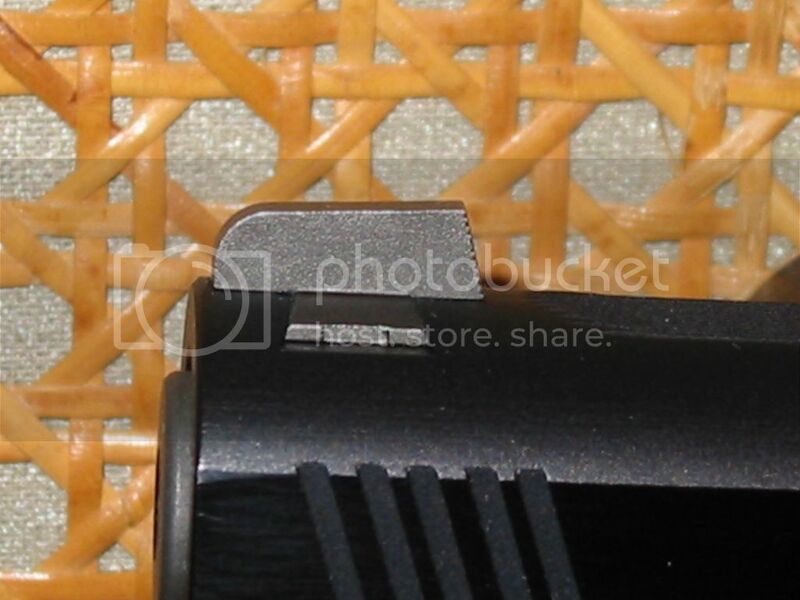 The Kimber magazines are polymer, and in the past we have had problems with Kimber’s polymer follower not sliding smoothly in the polymer magazine tube. We don’t know whether or not the world needs yet another .22 rimfire conversion for the 1911 platform. That said, the marketplace must think so, because within the past few years several makers have introduced or upgraded .22 LR conversions. Some of these, however, are not in the same category as the Iver Johnson conversion. Some are high-end, competition oriented conversions that cost two or more times what the Iver Johnson conversions sell for. In addition, many of the other conversions are not available in a Commander length. Many 1911 shooters are just happy to get a conversion but, for those of us who regard the Commander size as the optimum form factor for the 1911, being able to practice with Rimfire ammunition using a pistol that looks the same and has the same sight radius as one’s Commander-sized pistol is an attractive feature. Overall, the Iver Johnson Rimfire conversion is a high-quality product offered at a competitive price. Recommended.